When we dropped the game to the Colts, I was disappointed, but not heartbroken. We missed some opportunities, and we could not seem to stop Luck converting those big downs – the weakness that has and continues to be our secondary. Point is, it was a game we could have won. It was close, and for the most part I was pleased with the effort, the heart, that most of the team played with. I said that the Titans game was a must-win game for a playoff contention. It really was, and we embarrassed ourselves. The offense seemed stale, no one looked prepared, and no one looked like they had the heart to put the team on their shoulders and carry it for us. Bush was benched for most of the game, a decision that I personally am not entirely on board with. This loss, to a team that had struggled in every facet of the game all season long, was the turning point in our season. The road gets harder. The loss to the Bills was much the same in way of disappointment, disappointment over the effort and how prepared we appeared to be as a team. I just read an article by Armando Salguero of the Miami Herald, in which he asserts that the season is done and, as such, it’s time to get a good look now at the youth on the depth chart before free agency and the draft. I wanted to post these earlier but two crushing losses were hard to deal with. I will say that leading up to the Titans game I had an amazing weekend. Michelle and I were invited down to the 9th annual Miami Dolphins Web Weekend. It’s an event the Dolphins hold every year where they bring staff of Miami Dolphins fan websites down for a game, a locker room tour and some really cool other things. This is actually my 9th year and Michelle and I met at the weekend when we both ran other Phins related sites. I took a ton of photos so let me break down the weekend so you know what you are looking at when you check out the gallery. The first night of the weekend we had dinner at theÂ trainingÂ facility. Normally the Friday dinner is a little more informal with just free food and people hanging out talking. Last year we had a surprise visit from Nat Moore. This year they upped the ante with Joe Philbin surprising us. He talked to us for a while and signed some hats for our fundraiser. After that Sam Madison and showed up and talked with everyone for the rest of dinner. No one could get him to stop talking. It was great. He was showing people how he would defend Randy Moss and stuff. The next day we got up really early and went to the stadium and helped the Miami Dolphins Special Teams pack up care packages for the military for Veterans Day. 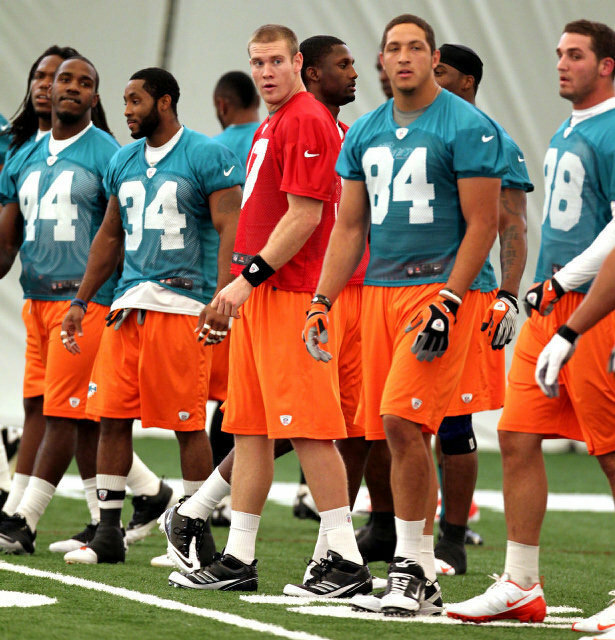 After that we had some time off and then met up back at the Dolphins training facility. There was a tour of the facilities and we saw that Richie Incognito had the Dolfans NYC shirt I sent him sitting on his locker. I thought that was pretty cool. The Dolphins equipment manager talked to us for a while which wasÂ surprisinglyÂ interesting. After that we had dinner and then we went into the team meeting room where we had a series of guest speakers. Some of them were Dolphins staffers you probably don’t care too much about, but the big ones were Mike Dee, Jeff Ireland and Jim Kiick. Jeff Ireland was hilarious. He came out right away and made fun of all his mistakes and the trip to get Harbaugh and what he called “Dezgate” He answered our questions surprisingly honestly and was very straight forward. It made me like the guy a lot. Of course that was before we lost two horrible games in a row where our team failed to show up completely. Mike Dee answered a bunch of questions and talked about how the new logo was going to be a combination of retro and modern. He told us he had showed it to Bob Greise, Nat Moore and Dan Marino and they all loved it. It got me exited. When he said he only had time for one more question I raised my hand. I thanked him for coming to our tailgate and then I told him that Michelle and I had a present for him. Â We walked up to the front of the room and Michelle handed him an envelope with $1000 that we raised for the Miami Dolphins Foundation. Â It was a really cool moment and he thanked us and the Dolphins staff photographer took photos. Next time we have to get him aÂ novelty sizedÂ check. Lastly Jim Kiick came up and was hilarious as well. Talked about how he hated Shula and it only took them 40 years to become friends. He introduced a documentary about the ’72 season and then did a Q&A after the movie. He also signed a ton of autographs and posed for photos. Very cool guy. At some point during the night (after the speakers but before the movie) the Miami Dolphins announce the “Webby Awards”. The Webbys are awards given to different Â fan sites. Dolfans NYC had never won one because we don’t have a forum and we aren’t very similar to the other sites so there hadn’t been a category for us to win. This year they added the Eddie Jones Community Award after the late Dolphins president Eddie Jones. We thought this was an award we could win since we do so much fundraising and we have a real community. Â So we were shocked when we actually heard our name called for another award. We won an award for best columns and features so that was pretty cool. We actually tied withÂ Phin Phanatic and then tied with them AGAIN for the community award. Brian Miller who runs that site is a really great guy so it was an honor to share the award with him. Â He won best over all site as well. As fun as Saturday was it was now game time. We woke up early Sunday morning and headed to the stadium just a few minutes after the gates opened. We did a few laps around the stadium and ended up at the Phin Addicts tailgate where they were hosting a bunch ofÂ militaryÂ members for Veterans Day. It was very cool. Those guys are serious fans. I would be in the Deep End with them every week if I lived in Miami. Before the game we hit the Nat Moore BBQ tailgate for some serious food and then got to go on the field and watch the team warm up. Finally we went to our seats in the “Locker Room Club”. The seats are actually on the field in the endzone and you are right there. You can then walk in the stadium right where the lockers are and you can see the players go in and out of the locker room. I have sat in these seats one before and it’s a much better experience when the team isn’t getting destroyed by the Titans. Another highlight was that Stephen Ross came over to the Locker Room Club before the game and shook my hand and told me how much fun the tailgate was. I had a copy of the Miami Herald that had a photo I took of him on the cover of the sports section so I pulled it out to show him. He signed it for me and a picture of us ended up on the Miami Dolphins Instagram account and on Mike Dee’s Twitter. Oh, and I saw Don Shula driving around theÂ fieldÂ before the game on a golf cart! Very cool. After that moment it was all down hill and we don’t need to talk about it except to say I got an amazing picture of the pick six Tannehill threw. Sign. Â Anyway, the pictures from the whole weekend are great and Â you should check them out by clicking here or using the Flickr slideshow below. Go Dolphins! Let’s go back to a simpler time where everything was right in Dolphins land. Where our Phins were up and we had won every game in October. It was a time before hurricane Sandy and before the Dolphins lost three games in a row. Let’s go back to our massive tailgate at MetLife Stadium in New Jersey where we brought hundreds of Dolphins fans together for the most fun you could possibly imagine as a Dolphins fan without them winning the Super Bowl. The tailgate was a blast, the Steve Ross showed up with Mike Dee, Fergie and Nat Moore and then the Dolphins absolutely demolished the Jets leaving hundreds of Dolfans NYC members chanting in the endzone. You could hear us on TV and Mike Dee and Reggie Bush tweeted about how we helped them win the game. It was incredible. Well ignore everything that has happened since then and check out this video from the tailgate hosted and edited by one of Michelle’s co-workers at Showtime, Alex Bente. It’s a great video and I think you should watch it all the way to the end. There are someÂ surprises. Enjoy the video and let’s hope things get better before the end of the year. I can’t take much more of this! Go Dolphins! Unlike many other sports leagues in the U.S., the NFL is a short season; it’s a brutal and punishing game that all too quickly takes its toll on those who play it. A loss at any time is big, and in the NFL it doesn’t take long for there to be one too many. I needed a little time to gather my thoughts following Sunday’s debacle. I have been guilty of hubris, and that arrogance made me look foolish this Sunday, as much or more so than our own beloved Dolphins. When the final whistle mercifully blew on Sunday, many fans were angry, shocked, lost for words, distraught… I could go on and on. During the game I felt many of these feelings, but as I walked home from 3rd and Long, I put it in my rear view mirror and reflected. Truth is, at the start of the regular season, had someone said that nine games in we would be 4-5, I would have been happy; I would have taken it. It’s been a wild week for NYC Dolphins fans. Last Sunday we were as high as we could be, wiping the Jets out and dancing in their home stadium. Then 24 hours later our city had been so badly damaged that it’s going to be years before we can fully recover. And then of course there was the Colts loss as icing on the cake. But we are New Yorkers and we are not going to let this mess us up! So many of our members and friends have had their places damaged or destroyed, people are without work and power. Dolfans NYC has beenÂ committedÂ to raising money for charity from day one and I can’t think of a better time than now to give. Last night I set up a fundraiser to try to raise money for the Greater New York Red Cross. I put a $1000 target goal, but hoped to eventually raise even more. In less than 24 hours we have already raised more than half of that and donations keep coming in. It just shows you how awesome this community, and the larger Dolphins community is. So check out this video I recorded at Third & Long during the Colts game on Sunday. We talk to some of the members of our club that have been impacted by the storm. These guys are the lucky ones but still have had some terrible stuff happen since the storm hit. And after you watch the movie check out our fundraiser page and make a donation. 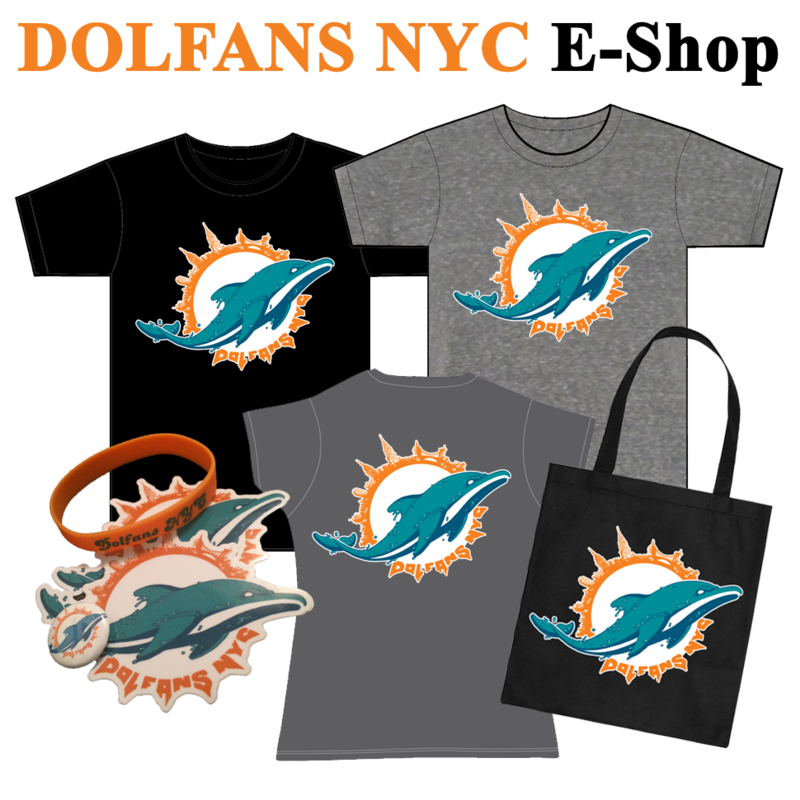 You can get some cool prizes including Dolfans NYC shirts which we are making available for the first time outside of Third & Long. So keep the donations coming. You guys are inspiring. I hope you are all safe out there. Go Dolphins! We Came, We Tailgated, We Conquered. What’s Next? Before we look ahead at things to come, let’s first revel in the glory of a truly epic victory over the Jets. Rex Ryan must be sweating as his seat grows ever hotter. 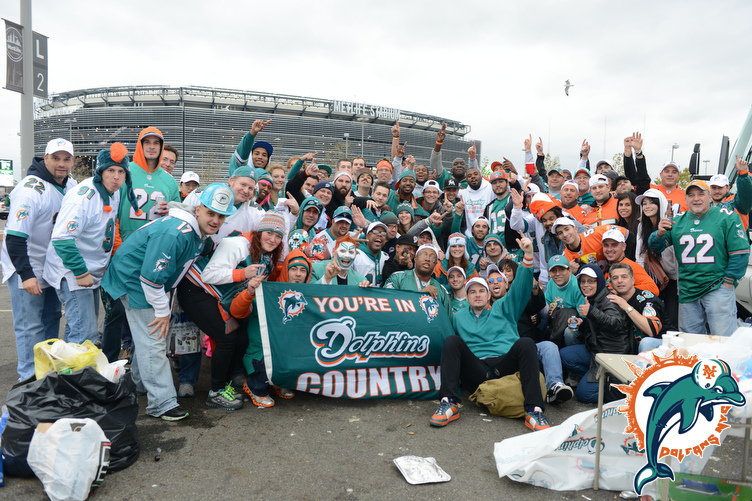 Perhaps even more epic than the victory itself was the event put on by Dolfans NYC – Michelle and Igor, Curtis, and all those involved with the tailgate committee – a big thank you from all who were there. Phin Nation took note, from the publicity we saw heading into the game, to the increase in membership on the Facebook page. Let’s not forget that Mr. Stephen Ross, Mike Dee, Nat Moore, Fergie and a host of Dolphin cheerleaders turned up at the tailgate as well, proving once again that the Dolphin fan base and the organization are the best in the league. Just so sweet to top it off with such a one-sided victory. Right – this Sunday, the Dolphins head to Lucas Oil Stadium, home of the Colts. Like the Dolphins, many pundits did not expect much from a team that finished in last place with their talisman QB. Seemingly landing the most coveted QB in college football would not be enough to get them back on track, but just like the Dolphins, the Colts currently hold a 4-3 record. Luck has been as good as advertised, throwing 280 yards a game. To give you a comparison here, his rookie year should and will turn out much better than his predecessor. Reggie Wayne has been the go-to guy throughout Luck’s season, catching 108 yards a game – a league best. Their defense is a capable unit: in the Colts, we have a perfect example as to why having decent QB play is so crucial for the success of a team. It isn’t just that Peyton Manning was so good, though that has a large part to do with it, it is more that Curtis Painter was so bad, the Colts were never really as bad as they appeared to be last year and, in many respects, I think that people underestimated how good many of the players on that roster still were. Enter Andrew Luck, and we have a revitalized Colts team ready to compete for a playoff spot.